Idyllic days on the Farm and the dog who would not be caged! A Carousel simply titled subject 17. 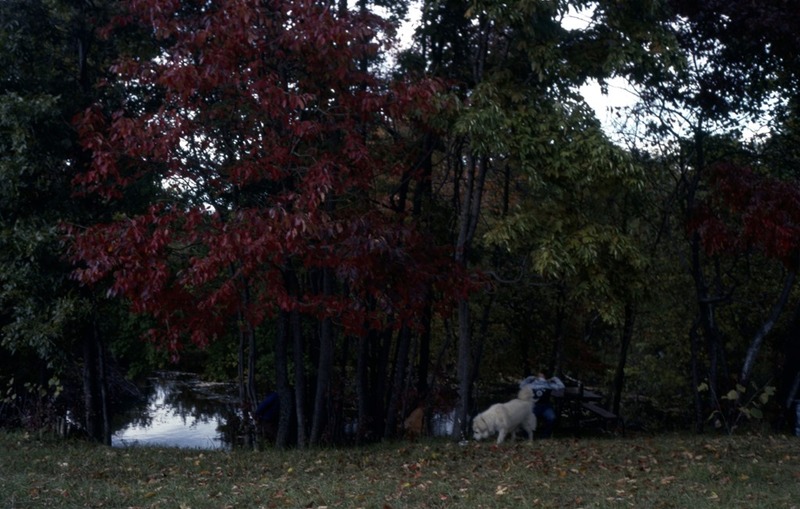 This is a picture of Frosty our insane Great Pyrenees and behind her the pond on the farm. Frosty for whatever reason didn’t like fences. She would run away all the time. Once while in heat she returned with a special surprise (giving birth to a puppy one night. We stayed up all night with her but the puppy didn’t make it). She would climb over an electric fence to get free. For whatever reason she decided she was not a dog to be fenced in. 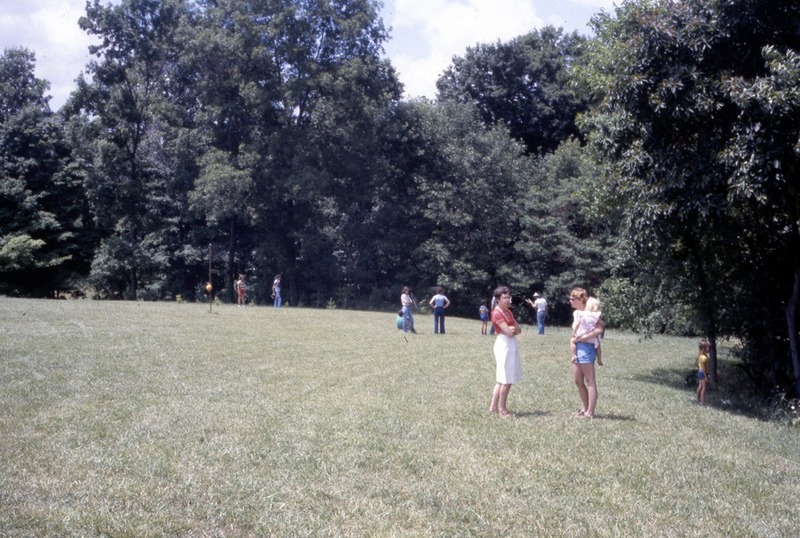 Directly behind this picture is where mom and dad put the barn (Ogle’s place) and later the house. The garage was back and a little behind this particular spot. There was a long wooden walkway from the garage to the house. Originally it was gravel but the wood walk way was added later. We built a volleyball court. I love volleyball and it took a whole day to find the right spot, dig the holes for the poles, let the cement dry and then mount the net. 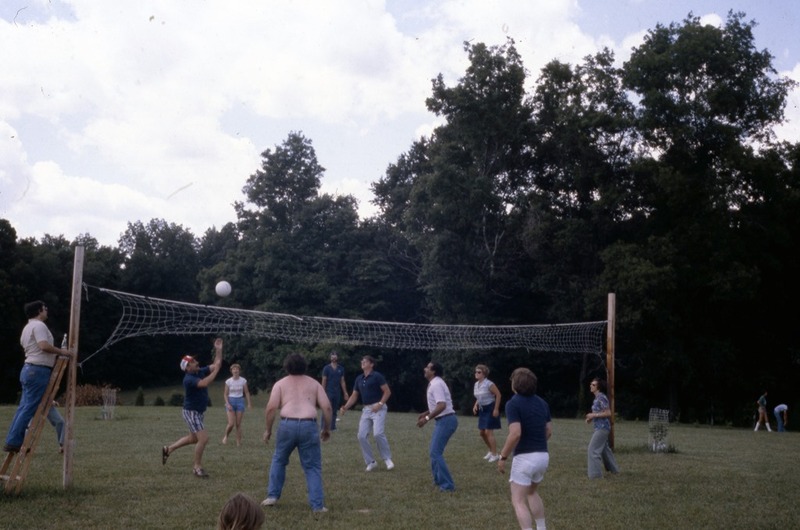 We would set up the volleyball net for parties dad would throw. Subject 17 so far has been Andersen Acres (The Farm). Dad put two large A’s above the garage door. We begged him not to put AA on the garage but he was determined. I think as much because we asked him not to as anything else. This also from a party showing the Farm. Dad was going to be a self-sufficient farmer. He did for a time raise cows, pigs and chickens. In all cases the eggs were superior, the ham, bacon and pork chops amazing and the beef was incredible. But the self-sustaining thing never really came to pass. It would have required solar or wind power, and a way to reuse many more things than ended up happening. It was a grand dream for a time though. Lately I’ve noticed my response to open ended questions has changed. I’ve been working on this “issue” for years but lately the working is well starting to work. I don’t answer open ended questions with an assured its this way anymore. I now ask the next question or start my response with “it depends on what you are trying to do.” That little and subtle change has taken me 10 years to implement. It is really hard not to answer the open ended question with a definitive answer. I still like to ask open ended questions. They are fun – but I do tend to post them on my blog as Random Thoughts. That by the way is the most responded segment I do on my blog. Everything else I’ve done over the years gets some level of response but people react to the Random Thoughts blogs with lots of interesting responses. I get the whole in a rush thing in the morning but if you cut me off and then HAVE TO SLAM ON THE BRAKES perhaps you shouldn’t have cut me off? Your morning prep routine works perfectly except for the whole staying in your lane thing – perhaps you could add that to your morning checklist before you get into the car? There are two commercials that I hear most mornings. I end up singing the theme song at the end of the commercial even thought I WOULD NEVER GO TO THE STORE in question. Why is that? 1 billion ants can’t be wrong. But what are they right about? Curse words don’t make you funny. Funny thoughts make you funny. The problem with driving to work for an hour is the random thoughts I have. There really isn’t a place to put them. Like a Phablet they don’t fit in my pocket. They aren’t like pieces of paper I could crumple and throw away. They just kind of bounce around in my head and end up spewing out into my blog every once in awhile. The traffic ones are often laced with profanity when they first come out so I tend to clean those up. It is in the end a family G rated blog. Is it bad when your dog takes over your massage chair? Is the Internet of things (iOT) just more things to lose? I’ve half a mind to, wait I forgot what I was going to say. I miss cellular dead spots. The range of my cellular phone is now directly proportional to the number of hours I work and the number of people I talk to during that work day. While we are on it, why television? why not Visiontele? After all its about seeing first rather than what you are seeing. I am addicted to Pawn Stars. That is the first step towards getting better acknowledging I have a problem. Just a few random thoughts and questions to start off a Thursday morning. Not sure where they all come from but I do know where a couple come from. It is in the end one of my long term themes, Washington DC traffic. Time to build another bridge guys. Oh, and to enforce aggressive driving and HOV lanes. Really. I have a couple of Kickstarter and Indiegogo programs I am watching right now. I will post my initial endorsements this weekend if anyone is interested. I had moved those over to my professional blog and am moving them back to my personal blog. I’ve been working with two campaigns that are about to be launched on their overall marketing and potential. I feel like the oldest person in the room when I have those conversations. Most of the campaign people I work with are I their 20’s. I was almost in my second 20’s when some of them were born. It makes me feel old. Happy Thursday – only three work days left in the week! PS – Labradors and screens don’t mix. Last night Raven when through the front screen of the front window. What a crazy dog. Now we have to leave the windows closed facing the street. Geez. We dragged our old couch out of the living room last night. It has moved with us twice (Indiana to Maryland and then once more in Maryland). The dogs weren’t happy this morning when they came downstairs to no couch. Sometimes labs have tough lives. I have no idea what plant, tree or animal in Maryland that I am allergic to but as usual spring begins with a runny nose. It is without a doubt the most annoying part of spring. Well that and the HUGE temperature fluctuations. We aren’t even to hurricane season yet. Yesterday I got an email from a podcast listener. They were asking about new Fred and Ed stories. Sadly there isn’t one for this month and I suspect there isn’t one for next month either. It takes a little bit of time to pull those together. They also asked about when I was going to post the Fred and Ed stories on my blog. I hadn’t even thought about that so the answer to that one is I have no idea. It’s a great idea from the email writer, I just don’t know if I will ever take the time to decompose the podcasts into blog posts. Do we really need 162 games of baseball? I’ve watched two and I am done for the year. If two users personal clouds collide is that a storm? I have a clock on my wall that is stuck at 7:59. What I don’t know is it stuck on AM or PM. Left turns are hard. Right turns are easy. Why do people turning right get special lights? I need a GPS to find my GPS. Email is as much a tool as an addiction. Time to get rolling – have to head off to the vet this am. Busy weekend – carpet cleaning and preparing for the new floor in the living room. It will be nice to get rid of Raven’s launching pad (she uses the carpet to gain speed when playing downstairs. I am cleaning the floor in the basement today so the carpet cleaners can come in and get rid of all the leftover urine. Poor Fran near the end peed almost every time she got up (not her fault and no blame) so there was a lot of urine in the basement. Hopefully the dry system will remove the odor and the stain although you really can’t see the stains due to the basement carpet being so dark. Still, it will be nice. Landscaping team is cleaning up, mulching and getting the front yard presentable. Its so much easier to hire someone else to do that than it is for me to do it. My father loves that kind of stuff, me not so much. I would prefer to write my blog than be outside doing yard work. The boys and I will mow the lawn and trim this year but other than that not much more. I like being outside for walks and hanging out with the pups but not so much for all the miscellaneous who ha of yard work. I’ve transitioned off my old Kindle to my new Kindle. Now what I need to do is work with AT&T to add the new Kindle to the wireless account. I like the separation of functionality that having a Kindle affords me. I use different devices for the one or two things they are really good at. Now, that said my office is pretty full of technology but oh well. I’ve been a fan of a Livescribe pens for a long time. As stated on this blog I am a pen and paper guy. I wrote the first poem I ever sold (and first story I ever sold) on an old Royal Manual typewriter (it was my father’s). My first foray’s into writing were an extension of paper, ink and whiteout. Sometimes, the paper was twice as thick because of all the whiteout. The reality of technology moves us further and further away from the pen, Apple doesn’t really even acknowledge that you need a pen in its touch reality. You can certainly add a pen but in the end it isn’t as needed. The new Livescribe does a nice integration – having the pen connected to the iPad so you can store the handwritten notes on the iPad and then sync with Evernote or some other tool. I’ve been advocating the segregation of home networks for a long time. Having devices on different networks based on what they are doing helps in the long run as far as the total in house bandwidth. You are still limited by the pipe to the Internet just like any company or organization would be. After a couple of weeks I am loving the Samsung NotePro tablet. The S pen is very handy and being able to draw on a screen shot of anything is amazing. I was thinking it’s a really cool personal telestrator – I am going to try that this weekend, doing a screen capture of a video playing on the NotePro and then using the S pen to draw on it. Add to that the Dropbox expansion for two years and it becomes an interesting device. I had literally based on all the things shared with me, run out of Dropbox space – now I have tons. Anyway – today is project day so I am back to all my projects. Got one done yesterday hoping to finish up two more today. Why is it confusing when you take your foot off the accelerator? Shouldn’t slowing down make things easier?